A new year, and a time for reflection and planning for the year to come. Take a moment and reflect on all you are grateful for. Start thinking about what you want to accomplish the year in your work life and your private life and start putting your plan into action! In your spare moments allow for lots of time for stitching and knitting, there are so many great projects to choose from. Below are a few we came across lately. A great new yarn addition to the shop. Wool, alpaca and silk, expertly blended. The rounded 6-ply strands have a luxurious cushy feel with great stitch definition. 4-4.5sts per inch, size 8-9US needles, 183 yards 100g. The Danube yarn is a DK weight, 163yds, 5.25-5.75sts per inch, it is made of slow striping fiber, silk like flecks and has a handspun look. Pia's gorgeous September Circle infinity scarf. She knit this with the wonderful Spincycle Dyed in the Wool yarn, a 2-ply sock weight Bluefaced Leicester, handspun, superwash yarn. Pattern by Melissa LaBarre and available in store. New in the shop, "Lace One-Skein Wonders." 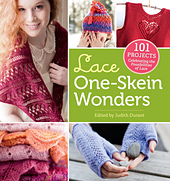 A great addition to the One Skein Wonders series of books, loaded with great projects! The headband above is "Drooping Elm Headband" from the book, knit with a DK weight yarn. Long winter days are made for Needlepoint. Here are a few of the most popular needlepoint kits this year. By Ehrman Tapestries, these kits were designed by Raymond Honeyman and are stitched on 12mesh canvas. Design sizes are 17.5" x 17.5". Kits include all wools and needle needed to complete the design. Cute as a Button, by TLC Designs. Pattern and Mother of Pearl buttons available in store.